I spent some time last weekend waffling over going to see The Nutcracker and The Four Realms. In the end, I decided that if I was going to watch the feature-length equivalent of a perfume ad, I’d rather spend that time on terrible made-for-TV Christmas movies. 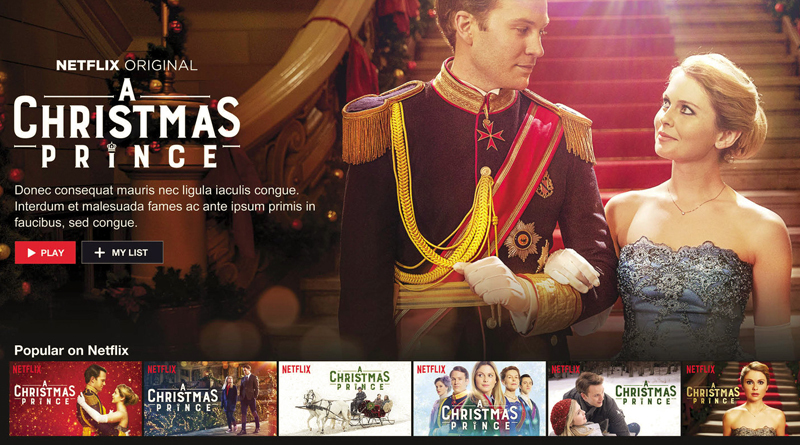 Traditionally, Hallmark has cornered this market, but in the last few years, Netflix has been getting in on the game. Two leads who will presumably fall in love + a tragic ending to a prior romance and/or a failed business/creative dream + magic and/or meddling relatives = everyone is happy by Christmas. End under the mistletoe. Julio noted that if Netflix has started making movies based on this Hallmark model, then we can perhaps assume that the poor production value is intentional. “That’s the point,” I said. So, as we turn the corner from Thanksgiving towards the Holiday Season, I would like to offer a brief guide to the best and worst cheesy Christmas movies on Netflix this year. Just please keep in mind that the line between best and worst is really very thin in this genre. The Holiday Calendar stars Kat Graham, Quincy Brown, Ethan Peck and focuses on a young photographer languishing in a holiday portrait studio when she wants to be doing her own art. Her grandfather (who you might recognize from This is Us) gives her an antique advent calendar that might have magical powers. As the calendar gives daily gifts, they have striking connections to the events of her day and her budding romance with a handsome doctor. Meanwhile, she reconnects with her best friend and starts to get on her feet in her photography career. Until she almost messes it all up. This movie was very charming and features a wonderfully diverse cast, built around funny family dynamics that give it a lot of hominess as a backdrop for the romance. Of all the movies I watched so far this year, it was by far my favorite. It had a nice dose of magic without getting out of the control with sweetness or romance. Christmas with a View was the worst movie I watched this year. It stars Scott Cavahiero, Kaitlyn Leeb, Vivica A. Fox, and the dad from Step by Step. The film is the story of a pretty restaurateur and a handsome celebrity chef who fall in love in a resort town. There is some family drama added for good measure, and an incredibly bland villain. In general, the plot did not hang together very well and the acting was terribly wooden. With all the options out there, I would skip this movie. Holiday Breakup was far quirkier than I expected, and in a fun way. It stars Manon Mathews (doing her best impression of Debra Messing), Shawn Roe, and Katie Leclerc. The movie has a different perspective and an offbeat sense of humor that sets it apart from the norm, as it follows the rise and fall of the romance between Chloe and Jeff. The pair breaks up on Halloween, then, instead of dealing with everyone pitying them over the holidays, they pretend to still be together. The parents are awful. The drama is high. The humor is pretty silly, but it would be a good palate cleanser after all the standard Christmas romances. A Christmas Prince made a bit of a splash last year, as it became incredibly popular despite having the kind of low production value that suggests they didn’t even have a script supervisor. The movie stars Rose McIver and Nate Atkins and tells the story of a mediocre journalist who goes undercover to find out the truth about a rambunctious prince. The story that unfolds is silly, romantic, and requires a lot of suspension of disbelief. This year there’s the sequel, A Christmas Prince: The Royal Wedding. I’m saving it for when I’m wrapping presents. Finally, there’s Christmas Inheritance which stars Eliza Taylor, Jake Lacy, and Andre MacDowell and tells the story of a socialite who wants to take over her father’s company, but is pretty irresponsible, so she first has to jump through a lot of hoops and do plenty of good deeds to prove her worth. It has faint undertones of Scrooge and is very corny, but delivers some pretty good laughs. If you want to up the ante on our own movie marathon, there is a Hallmark movie drinking game readily available on the internet. You could always adapt it with hot cocoa if you like to watch with kids. Enjoy!